What are the specific kinds of thyroid disorders? 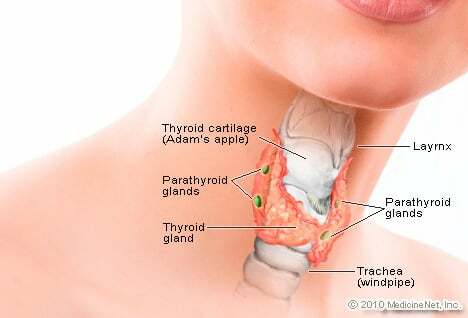 The thyroid gland is located below the Adam's apple wrapped around the trachea (windpipe). A thin area of tissue in the gland's middle, known as the isthmus, joins the two thyroid lobes on each side. The thyroid uses iodine to produce vital hormones. Thyroxine, also known as T4, is the primary hormone produced by the gland. After delivery via the bloodstream to the body's tissues, a small portion of the T4 released from the gland is converted to triiodothyronine (T3), which is the most active hormone. Thyroid disease is a common problem that can cause symptoms because of over- or under-function of the thyroid gland. The thyroid gland is an essential organ for producing thyroid hormones, which maintain are body metabolism. The thyroid gland is located in the front of the neck below the Adam's apple. Thyroid disease can also sometimes lead to enlargement of the thyroid gland in the neck, which can cause symptoms that are directly related to the increase in size of the organ (such as difficulty swallowing and discomfort in front of the neck). A goiter simply describes enlargement of the thyroid gland, regardless of cause. A goiter is not a specific disease per se. A goiter may be associated with hypothyroidism, hyperthyroidism, or normal thyroid function. Nodules are lumps or abnormal masses within the thyroid. Nodules can be caused by benign cysts, benign tumors, or, less commonly, by cancers of the thyroid. Nodules may be single or multiple and can vary in size. If nodules are excessively large, they may cause symptoms related to compression of nearby structures. In addition to thorough medical history and physical exam, specialized tests are used to diagnose thyroid disorders. Blood tests are typically done to measure levels of thyroid hormones and TSH. Blood tests to identify antibodies against thyroid tissue may also be ordered by your doctor, such as titers of anti-thyroglobulin, anti-thyroperoxidase, or TSH receptor stimulating antibodies. Thyroid scans using radioactive iodine are often performed to evaluate the function of thyroid nodules. The thyroid is the only location in the body that takes up iodine, so when radioactively labeled iodine is given, it is taken up by the thyroid gland. An imaging test typically shows uptake of radioactive iodine by normal thyroid tissue. Areas or nodules that are producing excess hormone (referred to as hyperfunctioning) will show an increased uptake of iodine. These are referred to as "hot" nodules or areas. By contrast, so-called "cold" nodules represent areas with decreased iodine uptake. "Cold" nodules do not produce excess hormone and can sometimes represent cancer. Thyroid disorders can be treated by medications or, in some cases, surgery. Treatment will depend on the particular disease of the thyroid. Medications can be given to replace the missing thyroid hormone in hypothyroidism. Synthetic thyroid hormone is given in pill form by mouth. When hyperthyroidism is present, medications can be used to decrease production of thyroid hormone or prevent its release from the gland. Other medications can be given to help manage the symptoms of hyperthyroidism, such as increased heart rate. If hyperthyroidism is not controlled with medications, radioactive ablation can be performed. Ablation involves giving doses of iodine labeled with radioactivity that selectively destroys the thyroid tissue. In most cases, thyroid disorders can be well managed with medical treatment and are not life threatening. Some conditions may require surgery. The outlook for most people with thyroid cancer is also good, although patients with thyroid cancer that has spread throughout the body have a poorer prognosis. REFERENCE: American Cancer Society. Thyroid cancer. Get answers about types of thyroid problems, as well as causes, symptoms, and treatments for thyroid diseases like hypothyroidism, hyperthyroidism, hyperparathyroidism, thyroid storm, other parathyroid diseases, and thyroid cancer symptoms. Please describe the type of thyroid disorder you have, and your experience with the disorder. What type of thyroid disorder do you have, and what treatments have you received? What type of thyroid disorder did/do you have, and please describe your experience with surgery for the disorder. How was your thyroid disorders diagnosed? Please describe your experience with hypothyroidism. Please describe your experience with hyperthyroidism. Please describe your experience with thyroid goiter. Please describe your experience with thyroid nodules. What type of thyroid disorder do you have, and what were your symptoms and signs? What makes you sweat (hidrosis)? Excessive sweating (hyperhidrosis) has many potential causes, including spicy food, smoking, drinking, hot flashes, anger, stress, anxiety, falling in love, and exercise. Learn why we sweat, how the body perspires, tips to control sweating, and more. Hyperthyroidism is an excess of thyroid hormone due to an overactive thyroid gland. Symptoms can include increased heart rate, weight loss, heart palpitations, frequent bowel movements, depression, fatigue, fine or brittle hair, sleep problems, thinning skin, and irregular vaginal bleeding. Graves' disease is the most common cause of hyperthyroidism. Many other health problems or taking excess thyroid hormone medication can cause an overactive thyroid gland. Treatment for the condition is with medication, radioactive iodine, thyroid surgery (rarely), or reducing the dose of thyroid hormone. No diet has been shown to treat hyperthyroidism or its symptoms and signs. Pernicious anemia is a blood disorder in which the body does not make enough red blood cells due to a lack of vitamin B12 in the blood. Pernicious anemia can develop from a lack of a protein that helps the body absorb vitamin B12, not getting enough B12 in the diet, and certain intestinal conditions that interfere with the absorption of vitamin B12 such as Crohn's disease, celiac sprue, or ulcerative colitis. There is no cure for pernicious anemia, thus treatment is life-long. Thyroid nodules are the most common endocrine problem in the United States. The term "thyroid nodule" refers to any abnormal growth that forms a lump in the thyroid gland. The vast majority of thyroid nodules are benign.